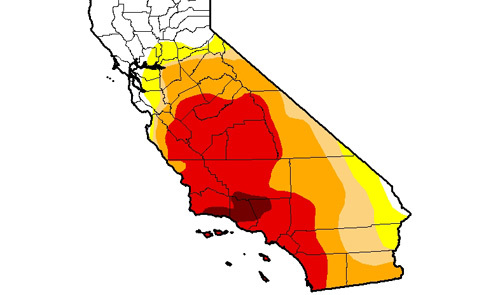 California's current drought conditions. The darker the red, the drier the land. Only two percent of the California land mass now fits that category and Lake Cachuma qualifies as the most distressed reservoir in California. Thirteen water agencies in Santa Barbara County have parked 30,000 acre-feet of water in the San Luis Reservoir in Los Banos, which is given 50-50 odds of spilling within the month. Should that occur, those 30,000 acre-feet will be water down the drain. Water officials are now scrambling to park as much of that water in other reservoirs as they can and are currently in negotiations with Irvine Ranch to bank 10,000 acre-feet in its groundwater basin. Such a deal, however, is costly, and would require a “payment” of 5,800 acre-feet to the Irvine company.